St. Martin's Griffin, 9781250007834, 336pp. The Empyrean is the only home 15-year-old Waverly has ever known. As members of the first generation to be successfully conceived in deep space, she and her boyfriend Kieran will be pioneers of New Earth. Waverly knows she must marry young in order to have children who can carry on the mission, and Kieran, the handsome captain-to-be, has everything Waverly could want in a husband. But there's a part of Waverly that wants more from life than marriage… and she is secretly intrigued by the shy, darkly brilliant Seth. Suddenly, Waverly's dreams are interrupted by the inconceivable – a violent betrayal by the Empyrean's sister ship, the New Horizon. In one pivotal moment, Waverly and Kieran are separated, and find themselves at the helm of dangerous missions, where every move has potentially devastating consequences, and decisions of the heart may lead to disaster. 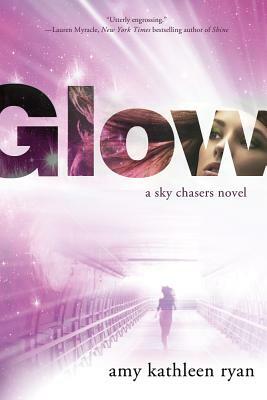 Pulse-pounding and addictive, Glow is the first novel in Amy Kathleen Ryan's riveting Sky Chasers series. AMY KATHLEEN RYAN earned an MA in English Literature at the University of Vermont, and an MFA in Creative Writing from the New School Creative Writing for Children Program in New York City. She is the author of Glow, Spark, and Flame and Zen and Xander Undone and Vibes.